When you were a child, did you long to ice skate like Dorothy Hamill or Scott Hamilton? If so, you may want to spend the day in Mammoth Lakes. You may want to think about starting your family’s outing at Toomey’s Breakfast, Lunch and Dinner. Located in the village on Minaret Road, it opens daily at 7 a.m. They serve such great dishes as coconut mascarpone pancakes, egg sandwiches, fruit laden oatmeal and island-style French toast. The beverages are also flavorful and hot. From there, bundle up and head on over to the outdoor Mammoth Ice Rink. Located on Sierra Park Road, it typically opens during the winter months at 9 a.m. and closes in the late evening. However, public skating hours do vary based on the weather and special events. So it’s best to call ahead. Once there, you’ll be able to rent pairs of skates or have the rink’s crew sharpen your own for a modest fee. Ice skating lessons and light refreshments are available onsite too. Because it is such a well-maintained ice skating rink, we’d suggest planning on spending several hours enjoying the facilities with your family. When you are finished ice skating, consider stopping by the Mammoth Lakes Library. It’s located next door and tends to open around 10 a.m. Special programs are offered throughout the year. So depending on the schedule, you may get to enjoy one while you are there. In addition, you could check-out a few ice skating books to read with the kids. Books that the kids may enjoy are Andrew Breakspeare’s Skating with Bears and Rachel Isadora’s Sophie Skates. Both are geared towards young children and listed in the Mono County Free Library’s card catalog. After the library, you may want to cap off the day with an early dinner at one of the area’s restaurants or a walk through the nearby Mammoth Ski Museum. It is located on College Parkway. 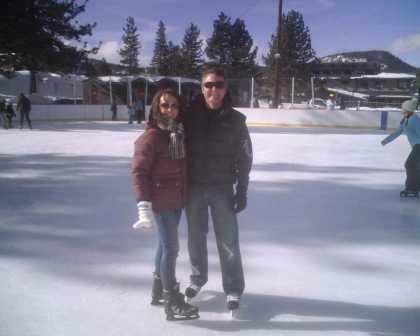 To learn more about Mammoth Lakes, CA and its winter attractions, please contact us at (855) GO-MAGGIE. Later, we hope that you’ll stop by and “Like” our Facebook page too.